A group of tourists and a BBC camera crew have made a dramatic escape after Europe's tallest active volcano, Mount Etna in Italy, erupted Thursday, CNN reports. Surrounded by steam and with boiling hot rocks pelting down on them, the group sprinted to a nearby rescue vehicle that took them to safety. Ten people were injured, but none seriously, Italian news agency Ansa reports. 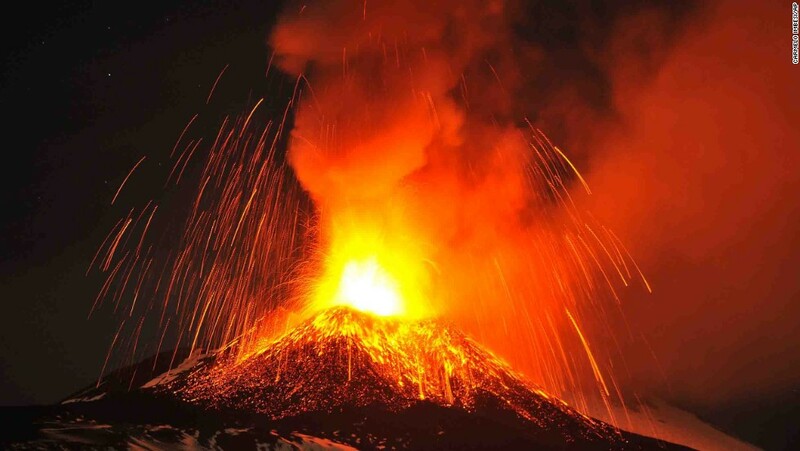 The volcano, on the island of Sicily, has been particularly unsettled in recent weeks and the group had made the ascent to take a closer look at the ongoing volcanic activity. Rebecca Morelle, the BBC's global science correspondent, described the group's rapid descent. "Running down a mountain pelted by rocks, dodging burning boulders and boiling steam -- not an experience I ever ever want to repeat," she wrote on Twitter shortly after the incident, adding that it "could have been worse -- explosions like this have killed." Morelle later posted a photo on Twitter of camerawoman Rachel Price holding up a jacket with a hole burned through it by a "lump of rock".